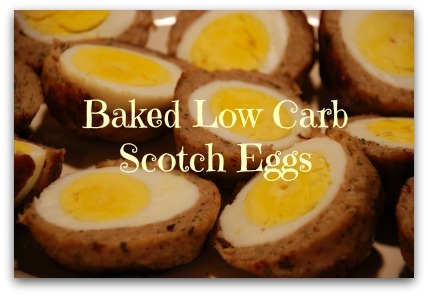 A scotch egg recipe for your low carb needs. 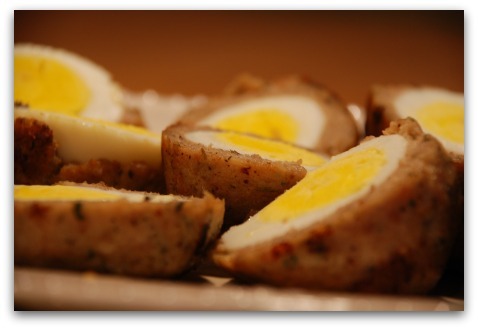 This baked scotch egg recipe is simple and easy to make. I've kept it low carb by avoiding the flour and breadcrumbs usually called for in the recipe. If I'm not taking Deviled Eggs to a pot luck then this is my next appetizer of choice. I'll add photos and nutritional list very soon. Thoroughly mix pork with herbs and spices. Divide into 6 equal portions. Wet your hands in cold water so the meat won't stick to you. Take a pork portion into the palm of your hand and flatten it out by patting it down. Place egg in the middle and wrap evenly around the egg. Be sure to cover completely. Repeat with the remaining eggs, wetting your hands each time you handle the meat. Place on a parchment paper lined cookie sheet and put in the oven on the middle rack. Bake for 30 minutes turning the eggs over halfway through. The meat may shrink as it cooks, exposing the egg. Don't worry about it. When time is up, let them rest about 5 to 10 minutes before cutting them in half with a serrated knife and chowing down. These are great hot, room temp or cold. Great as a quick snack, hurried breakfast or appetizers at a pot luck event. As good as the real Scotch Egg recipe? I wasn't sure if this would be quite as good as the traditional recipe. Truth is, I don't miss the breadcrumbs and the messy deep frying at all. Everyone who has tasted them really loves them and asks for the recipe. So that's a pretty good sign! You can easily double or triple the recipe if you're having a crowd for a party or other function. They disappear in a flash! Lately I've been making them regularly and I find that one or two halves with a small salad at lunch time is enough to keep me going for the rest of the day. They are very filling! Make sure your oven is properly calibrated so that you hit 400F, otherwise the meat will not become golden and crispy and the meat may actually slip off the eggs. Let's leave the scotch egg recipe page and go Home.